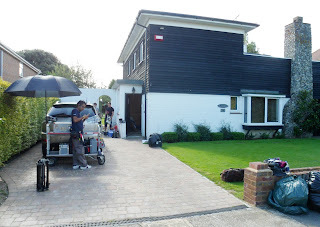 Quite by chance on my cycle ride this morning, I came across the house where David Tennant is filming a new BBC drama series, 'Love Life' with Billie Piper. It's just back from the seafront at Birchington at Epple Bay. I'll take a bigger camera along next time and see if I can grab some better photos. The film crew were busy setting-up as I came past, the only thing narrow enough, on my cycle, to get down a very busy road, with all the parked up production vehicles. I'm afraid there you are quite wrong and particularly where news on David Tennant is involved, interest is measured in the thousands, just look at the page view graph if you don't believe me! So I'm simply delivering what people want. If you want something else then you don't have to stay here. Please keep on doing what you do. it does say it's my personal diary but you can't please some people I'm sorry to say! silly question do you know where they will be filming in the morning ? No idea, I only found the location by accident! Anonymous 12.16 PM - Waste your time no longer then ! Would you read the phone book just because it's there ? You have obviously been on here reading articles before and didn't learn your lesson then ! It's his blog, his diary and if you don't like it then don't read it !